In these blog post series I will cover different business models you can run on eBay. Some of these models can be incorporated into your existing eBay business, as well as operated as standalone businesses. In addition, most of these concepts will be perfect for building small, simple online shops. Today, I’ll cover a very profitable, unexploited opportunity of selling all kinds of replacement parts for healthy profits! 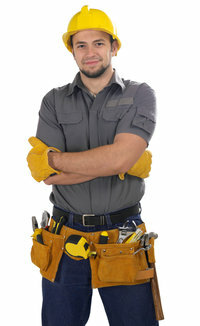 By replacement parts I mean items that can be used to fix a broken product or to replace a used part of the item. Covers, cables, plugs, shoe heels and thousands of other, highly demanded products are being sold on eBay every day. Yep, it’s pretty much dead trampoline jump mat! You can write your guess on what happened there in comments block below this post! Most interesting comment author will get a special, reader’s prize from me! As only mat part was damaged, I started to look for a replacement. And I found it on eBay, of course! It cost me £30, not bad right? Yes, of course but I bet that seller made a very good profit out of my purchase as such replacement mats can be bought from China for less than 10 quid a piece. 1) Less competition. Great thing about replacement goods market is that usually competition will be less as most people concentrate on selling brand new items! For example, a person searches for a printer tray to replace a broken one – if you’re the only person selling such an item on eBay, you have no direct competition and buyer simply have no choice but to purchase from you. 2) Higher profit margins. Profit margins with most of these items will be very good, especially if you’re the only one selling that particular item on eBay. If you can sell generic/un-branded or your own brand items – even better! 3) Higher conversion rates, URGENCY! Imagine your laptop battery is dead – how long you’ll wait to replace it? Exactly! In situations like these, people are not just browsing eBay, they’re in active buying mood and if your offer matches what buyer is looking for, you’ll get an easy sale. 1) Hard to find stock. Not all replacement parts are easy to source, especially if we talk about original, branded parts. If possible, stick with un-branded/your own brand items. For branded stock, you’ll have to dig deep and use Google to find companies selling required items. You may have to import from the US or Europe to source hard to find items. 2) Slow moving stock. If it’s not a very popular item, you have to be prepared for regular but small sales. This is one of the main reasons why people tend to stay away from replacement parts BUT as you know – the less people do this, the more money you can make. Source items in small quantities to avoid large losses caused by dead stock. 1) Always do some research before purchasing stock! 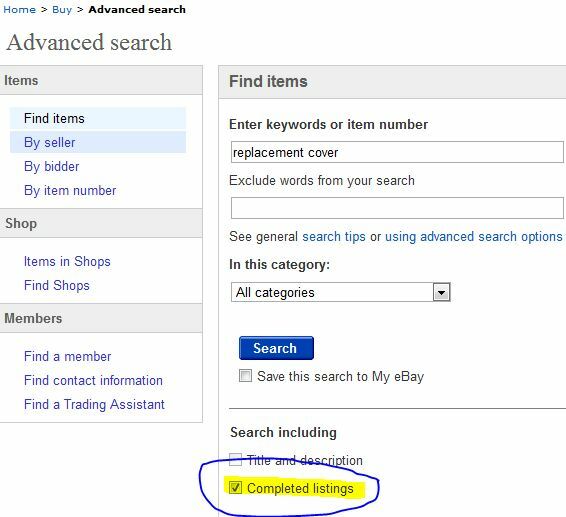 Finding potential items is very easy – use eBay and Google and pick any product + add words like “replace”, “replacement”, “parts”, “cover”, “lid”, “broken”, “fix” etc. This way you can find hundreds of potential products within few hours time. When you have a list ready, use Terapeak.com or Advanced Search on eBay – Completed Listings ONLY to see if such item already sells on eBay, for what prices etc. If you can’t get any results on eBay, this could mean that no one is selling such an item OR that there’s no demand for it. The easiest way to find out answer to this is by using Google Keyword Tool. IF people are searching for an item using Google, it almost always means there will be potential buyers on eBay too. When using Google Keyword Tool, don’t forget to set search results to UK only (or whatever country you want), Exact Match results. This will give you most accurate results and idea on potential demand. You can also use “Additional Keywords” feature to find any additional items that fit your search criteria. 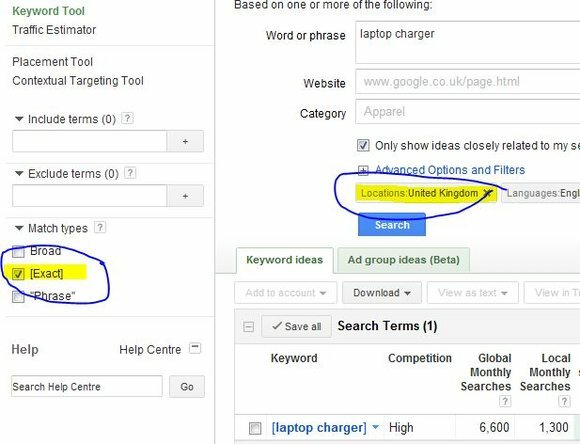 Also, if you see high number of searches in Keyword Tool and small competition, you should think about putting together a simple online shop! This way you can get free traffic from Google and avoid eBay altogether. This will only work if you’re comfortable with setting up online shops though. 2) If possible, go with un-branded, generic or your own brand items. This is crucial if you want to maintain high profit margins in niches where you’ll not be the only seller. From what I have found, when we talk about replacement parts, people are actually not that bothered about getting ORIGINAL replacement part. It already failed once, so why pay more? There will be some exceptions of course, like with laptop batteries and other, highly sensitive items, but in general, if I need a replacement printer tray – I don’t care if it’s branded or not! As long as it’s quality item and fits perfectly, I’m 100% happy to buy un-branded item. 3) Create superb offer to super charge your conversion rates! Yes, even when working with replacement parts, you want to create great looking listings, include detailed pictures and product description. Any technical/model related information should be properly featured as you want to make sure potential buyers are getting correct item. If dealing with more technical items, a good idea would be to include a quick guide on how to replace item. You can even feature this as a special, valuable bonus that you give away for limited time to all buyers! For example, if you sell microwave turntable motors – you could actually take some pictures and create a quick 1 or 2 page guide on how to replace it. I’m sure your customers will appreciate this and your conversion rates will increase as a result! Ok, so here it is – a workable, profitable eBay business model ANYONE can work with! This is also perfect for people with small buying power as you can simply start with one item and go from there. You can add these items to fit your current eBay business, niche. In fact, if you sell anything that can be replaced, make sure you sell replacement parts too. You can even place small stickers with your contact info inside parts you know broke often so that customers know where to go when that part goes down. You can even create a brand new eBay business based around this model – brand it accordingly (replacement parts/fix/repair theme) and position yourself as an expert – again, to increase conversion rates. A blog with How To Guides would also fit perfectly in such business! Lastly, to give you some inspiration on what kind of items you can sell, I have put together a list of 20 examples on what can be sold. You don’t have to copy these examples – just use them as a guidance to find your own product ideas! P.S. Don’t forget to comment on what happened to my trampoline mat for a chance to win a special, reader’s prize! Thanks for this informative blog. Lots of new ideas to research there. Could be caused by magnification of the the uv rays on any clear objects from the sun burning holes through the bed,or you have had chinese lanterns landing on there. The last link you give shows a company that does what you are suggesting as in making a business from providing spare parts. And they are doing very well from it by the looks of it ! Yep, exactly – turning well over £100k per month on eBay alone. I’ll keep this open for a few more days and then announce winner/winners in a separate blog post on Monday or Tuesday next week. Was it someone with a magnifying glass on a sunny day? Overzealous bbq technique coincidentally coupled with a minor meteor shower on the same day? That’s very good Jim & Kav !!!! Whilst training for the Olympics, Andrew was attempting his famous back-somersault-double-twist-with-pike routine. Whilst in mid-flow and upsidedown, the pike slipped out of his hands, fell onto the trampoline with Andrew trailing slightly after. His slim but muscular body then landed on top of the pike, which being a fish was somewhat slippery. Andrew skidded on the pike and there was no going back. All hell broke loose with Andrew and the pike fighting for stability on the trampoline jump mat. The pikes dorsal fin is a sharp, razor like weapon and as the fish was bouncing around on the mat, its fin was doing its job with the resultant damage. However, being the sort of person to never give up, Andrew practiced on a neighbours trampoline and ultimately won a medal at the Olympics for this very same jump. 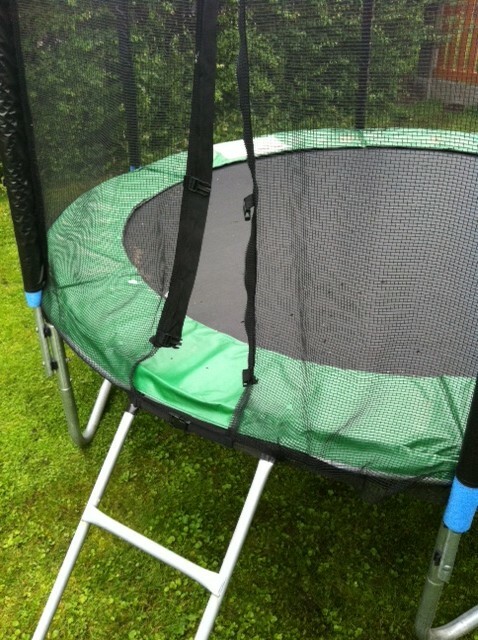 He decided to flog his medal on ebay for £30 and used this to purchase a new replacement trampoline mat. I think what happened to your jump mat was a UFO landing causing damage to the jump mat. Thinking your trempoline was another UFO under cover. A real UFO attempted landing close to it to investigate. 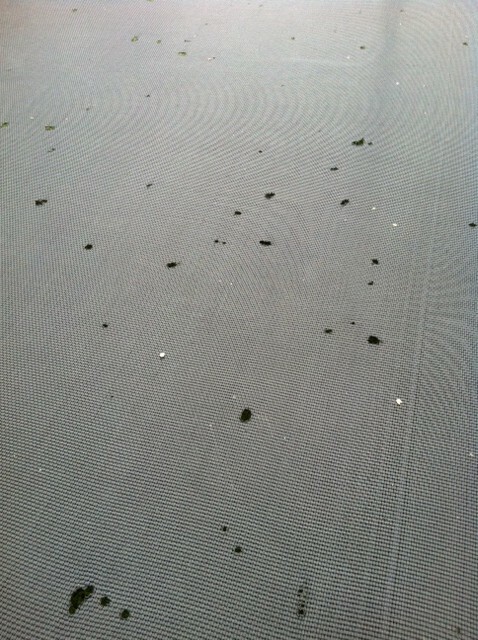 The holes are the hot embers spewed from the landing UFO exhaust jets on to the mat and burning it through. but clearly forgot they had a cigarette in their hand when they started their routine!! Hmm they look like burn marks.